Rudy Gay was not part of last year's team that had a remarkable postseason run, bulldozing the then top-seeded Spurs and forcing the young and mighty Thunder to the brink. He is considered by many (excluding me) as Memphis' best and most valuable player. His return to the fold this season was supposed to bring them added firepower from the perimeter, which should bolster their campaign... but lo and behold, the Grizzlies have found themselves one loss shy of elimination against newly-formed Clippers. Did Gay's return inadvertently make the dreaded Grizzlies less fearsome? Let's discuss it point-by-point after the jump. First, let's try to examine the guys that where key cogs to their campaign last year that aren't on their roster this postseason: Darrel Arthur, Sam Young, Shane Battier, and Greivis Vasquez. These players, though may seem like virtual unknowns to the masses, played huge roles to the Grizzlies' great success last year. Averaging, 7.1ppg, 7.5ppg, 5.5ppg, and 4.3 ppg during last year's playoffs, respectively, these defense-oriented and highly efficient, not to mention high-energy, shock troopers made last year's Grizzlies a fearsome bunch. The good thing about these guys was that they didn't need the ball in their hands to be effective. They allowed Randolph and Gasol to operate down low with proper spacing and more low post plays. Now, let's try to examine their key additions this year: Rudy Gay, Marreese Speights, Quincy Pondexter, Gilbert Arenas and Dante Cunningham. Gay leads the team with a little over 21 points per game, thus far, while Speights and Pondexter chip in 8.0 ppg and 4.8 ppg in the postseason, respectively. Cunningham and Arenas are basically just roster fill-outs as of this writing. Okay, the point-production between those of last year and those of this year's additions are relatively comparable. Make no mistake about it. 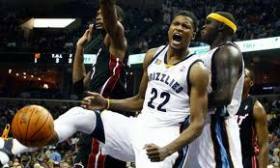 I believe that Rudy Gay is a great player and that he certainly deserves the value that his team sets for him. His numbers should be enough proof for that. However, numbers aren't always everything. Individual production is not always a reliable indicator of a player's contribution to team success... or in this case, team failure. One must also examine the collective performance of the entire squad. Hence, this leads me to the crux of this piece: Rudy Gay’s presence has caused more harm than good. To cut the long story short, having Rudy Gay meant less touches for both Randolph and Gasol - players whom I think are more valuable for this franchise. The Gasol-Randolph frontline is among the baddest in the entire league. With Gay's return, there has been a considerable dip in the production of both big men. Last year's playoffs, Randolph logged 22.2 ppg(led the team), 10.8 rpg, and 2.4 apg, while Gasol contributed 15.0 ppg, 11.2 rpg, and 2.2 apg. This postseason, thus far, Randolph's performance dipped to 12.5 ppg, 7.8 rpg, and 1.0 apg, as Gasol also struggled with 10.3 ppg, 6.3 rpg, and 3.3 apg. The glaring drops in both point-production and rebounding are striking, to say the least. With Gay at Hollin's disposal, their offense had gone perimeter-heavy, which corresponds to more long rebounds and less opportunities for offensive rebounding from their frontline. It's still not too late for the Grizzlies, though. They still can turn it around if they try to refocus their offense and feed Gasol and Randolph more. This strategy worked almost to perfection last season with a bunch of role players. It should theoretically work better with a player of Gay's caliber if he only plays the role player's role... just as the likes of Sam Young, Darrel Arthur, and Shane Battier wonderfully did last year. I wanted the Grizzlies to win their series against the Clippers for the Spurs to have the chance to erase the stigma of their first round exit last year... but it seems like they don't have a clue about what went wrong. Perhaps they'll find out a little bit too late really soon.